When it comes to care for your trees, no one does it better than Travis Pest Management! Don’t let aphids, scale, caterpillars, mealy bugs, white fly, mites, or disease damage or destroy your lush trees. Travis Pest Management, Inc. offers a tree program to help protect and feed the trees in your landscape. We offer single, every other month (EOM) and quarterly applications. With our Palm Tree fertilization program, you’ll have the best-looking palms in your neighborhood. 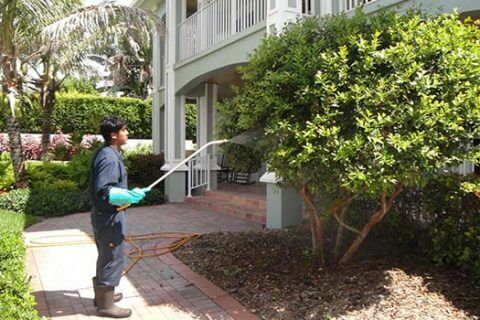 In some cases, we are able to add this service to your shrub and ornamental program. Re-applications are tailored to the type of tree being serviced and protected. Trees higher than 15 feet tall are treated only when necessary and when weather conditions are appropriate. Do you have citrus, avocado, mango or other fruit trees in your Florida landscape? Are you unhappy with the quantity and/or quality of your fruit? If you answered yes to the above questions, then you may need the Travis Pest Management Citrus & Fruit Tree Program. Travis Pest Management, Inc. has been offering a citrus fruit tree program since the 1980s. The goal of our citrus program is to maximize the tree’s ability to produce the freshest fruit with the most flavors possible. Today, our fruit tree program includes citrus, mango, avocado & banana trees among others. Fruit trees receive four applications per year. Fruit trees receive three applications of environmentally friendly 50% slow release fertilizer. Each treatment includes the application of insecticide for the control of fruit-damaging insects like aphids, mites, hard scales, soft scales, mealy bugs, white flies, black flies and leaf miners. These insects are known to be vectors of disease which can have lethal effects on your trees. Fungicide treatments are administered as needed for the control of Greasy Spot, Scab Infection, Melanose, and Alternaria Brown Spot among others.